Card games are so much the rage these days that I'd completely forgotten Bethesda was cooking up one of its own. Slow-cooking, I should say. 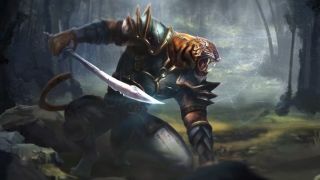 Though The Elder Scrolls: Legends was targeted for the end of this year, Tweets from vice president of marketing Pete Hines (yes, the chap who wrote the sick note) have confirmed that we'll see it in 2016. Also according to Hines, the game is playable as-is but unpolished. Details on how you'll battle it out in Legends are scarce, but I'm hoping it's paced in such a way as to distinguish it from Hearthstone. I'd enjoy a deck-building Dominion-alike with an Elder Scrolls twist, but alas, that doesn't feel conducive to the free-to-play model Bethesda announced at E3. I'm curious as to what the team is planning rather than dismayed by the delay.